There are notable trees aplenty in Oregon, and you may have visited some of them on weekend forays across the state. However, trees have finite lifetimes. They are vulnerable to disease, rot, weather or humankind incidents. While not all of the trees represented in the“tree memorial” are Oregon Heritage Trees, during their lifespans many were beloved in their communities and by tree aficionados. We will be adding more “gone but not forgotten” trees below, as the Oregon Heritage Tree Committee unearths more contenders. If you would like to tell us about a tree (or trees) that had a vital connection to Oregon history, please contact us. Silverton’s Old Oak Tree was once a very large oak tree. 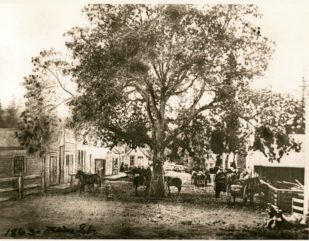 Early Silverton pioneers developed the townsite around the tree, which stood for many years at the intersection of Main and First streets in downtown Silverton. The tree was felled in the 1880s as Silverton grew in size. Its large branches were divided amongst the townspeople. “Klondike Kate” Rockwell, a colorful resident of Central Oregon during the early 1900s to the 1950s, was an avid rockhound. One day during a windstorm at her homestead in the High Desert region, two petrified wood stumps were revealed. The stumps were remnants from an ancient sequoia forest that would have thrived in the region thousands of years ago, when the area was dominated by large lakes. After Kate relocated from her homestead to Bend, she arranged for the petrified stumps to be hauled into Bend. At the time, the Bend Bulletin pegged the stumps to be in excess of 20,000 years old. The stumps were presented to the firemen of the city and were installed near their downtown station by a memorial fountain. 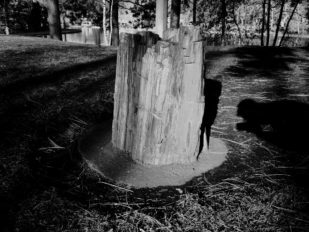 When the fire station was later relocated, the stumps were gifted to the City of Bend who installed them in Drake Park. They remain in Drake Park to this day. (*Image courtesy Nate Pedersen) Learn more about Klondike Kate Rockwell. The Mammoth Sugar Pine formerly stood in a grove of large, old-growth sugar pines along Highway 62, between Prospect Ranger Station and Union Creek, in the Rogue River National Forest. 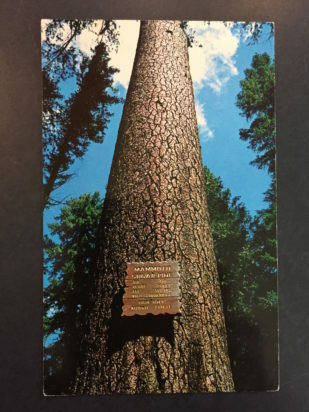 The stand of pines was once considered “the greatest stand of sugar pine in the world,” and an interpretive center was installed nearby to inform tourists traveling through the region about the massive trees. 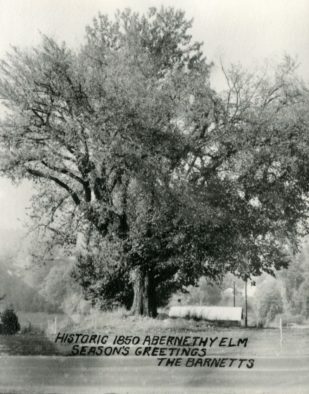 The Abernethy Elm tree was an American Elm (Ulmus americana) planted by Anne Abernethy, the wife of Oregon’s first and only provisional governor, George Abernethy, next to their home on the east bank of the Willamette River in what is today, Oregon City, Clackamas County. The elm, planted in 1850, grew to a very large size, and became a state landmark. The tree was witness to the development of Oregon and survived repeated flooding of the Willamette River, the construction of Highway 99, and the growth of Oregon City. A planned bridge for Interstate 205 was moved slightly south of the tree in order to preserve the elm in the 1960s. The tree finally succumbed to old age in 2001. The Judge Shaw Christmas tree, a Norway spruce (Picea abies) was thought to be the first living Christmas tree in the United States. The tree was planted in 1882 on the grounds of the Marion County Courthouse in Salem, Oregon, by Judge T. C. Shaw. 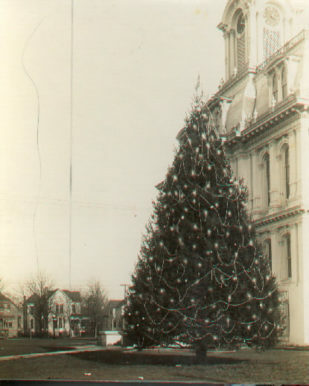 By 1913, the tree had reached a height of 40 feet and was conscripted by a burgeoning electric company in Salem to be lit up as a public Christmas tree. 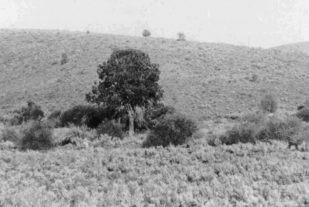 After some research, the local civic organization boasted that it was the first live (uncut) community tree in the United States.